Humans not only crave light, we need it for physical health. In winter especially it’s not easy to get enough light through the windows, so we need to supplement to turn a dull room into something vibrant. And on summer evenings, we need a little ambiance. But different rooms require different kinds of lighting which is where the notion of layering the light comes in. The first layer is general lighting, a single source in the centre of the room, made beautiful in dining rooms with a dynamic chandelier (always installed with a dimmer by the way). Your second layer is accent lighting, such as table and floor lamps, and the third layer is task light, such as a bed light to read by or track lights or under-counter lights in the kitchen to work by. Determine each room’s purpose and create a plan based on what kind of activity you do there. Some rooms need overall good illumination while others need concentrated light in certain areas. Highlight art pieces or photos on the wall with accent lights such as sconces or spotlights. Uplights illuminate architectural details like coffered ceilings, arches, or nice bookshelves. Since your living room is for company and conversation, you want to control the amount of general light, so overhead lights – pots and pendants – should be on dimmers. Table lamps will provide soft pools of light for reading, and are more flattering than overhead. For relaxing, light in this room is best when it’s soft and subdued. So a dimmer on the overhead lamp, or dispense with overhead altogether and instead use table or floor lamps for general light. Bedside lamps should be smaller than ones you would use in the living room, especially since you will need room on the night table to put other essentials. When it comes to these lamps, use accent colors that complement the main colors of your bedroom. For an even softer look, choose a shade that’s white on the outside but a warmer colour inside. The bedroom isn’t a place to have candles – too much chance of falling asleep with them burning. Chandeliers and pendant lights are a staple of dining rooms, but adding a lamp or two increases the ambiance. For example, placing two lamps on either end of the sideboard creates a symmetrical look and adds extra, subtle lighting. Coordinate the lamps’ colors with those of the room; these lamps shouldn’t be a focal point. Softer wattage in the chandelier or pendant light will also be more flattering to the people around the table. Break out the task lamps for this one. When you’re working, you need to focus on what you’re doing—and so does your light. Keep your desk and table space uncluttered by choosing a floor lamp for your ambient light. Also, to help you keep your focus on what you’re doing, choose lamps with simpler styling. Lamps that blend into the decor of your office are less obtrusive and distracting, allowing for a much more productive workspace. Don’t forget about the bathroom. Mirrors and medicine cabinets really need lighting – sconces above or on either side – to give you enough light for makeup or shaving. If there’s only one overhead light make sure it suits the décor and that it’s a stand-out feature. 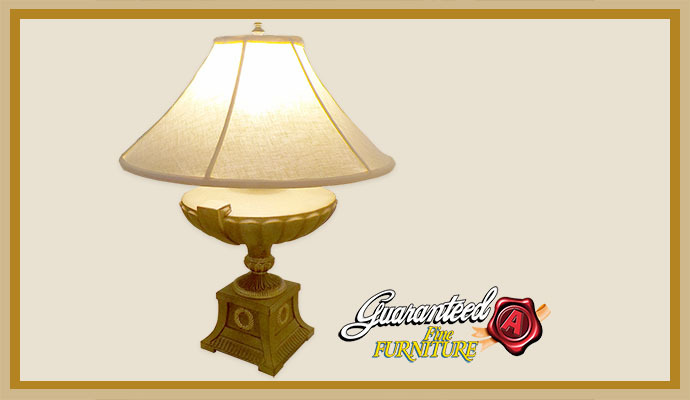 Guaranteed A Fine Furniture is your destination for all your home lighting needs. Come in today and let our design experts help you plan a lighting scheme that will work best in every room.